Intellitech Model AFSM1500, 2-Up, automatic, continous motion, stainless steel, rotary filler, capper, print and apply wrap labeler, monoblock system with number of containers per minute – depending on materials and application. Container size: Diameter and Height per appliaction. (last running 1.5mm micro tubes). Equipped with 30" OD vibratory container feed bowl with 42" long dual container feed chutes to 25" OD turret with (24) stations set on 3" centers. Stations 1 and 2 container cleaners, stations 3 and 4 dual bottom up fill, with Ivek pump and no container / no fill, 16" OD vibratory cap bowl with 24" long cap feed chute to stations 5 and 6 cap place, stations 9 and 10 cap tighten, stations 11 and 12 cap vision check, stations 13 and 14 double tube gripper discharge to 16" OD turret print and apply wrap label section, has LSI label system with panel view controller and Sato print engine. Control panel has PLC controller and A/B panel view touch pad controls, with vial bowl and vial track, cap bowl and cap track power on / off switch and start, stop, e-stop push button controls. Mounted on stainless steel base frame with Class 100 enclosure with a HEPA filtration system, UV germicide lighting, polycarbonate doors and magnetic interlocked safety switches and leveling legs. Cozzoli Model FSV2P, automatic, monoblock filler / stoppering machine rated from 10 to 100 containers per minute – depending on materials and application Flushs, fills and stoppers vials. Fill range from 0.5ml – 30ml with +/- accuracy of 1/2 %, and is capable of handling vials, and straight wall tubes with minimum / maximum dia of: 5/16" – 1 1/2", and a minimum / maximum height of: 1 3/8" to 4 3/8", and able to handle stoppers from 13mm – 30mm all with proper change parts. Fed by 24" diameter disc unscrambler, all stainless steel contact parts and aluminum top. MRM Elgin / Zalkin, stainless steel, monoblock 12 head filling and 8 head capping system with number of containers per minute – depending on materials, application and machine configuration. Equipped with 100" long x 3-1/2" wide container belt conveyor with worm screw to star wheel in feed and discharge, MRM Elgin Versa 12 head time pressure filler has 1" OD nozzles, set on 5-1/2" centers with 6" wide x 6-1/2" long container lift pedastals. Fill volumes: 5cc to gallons with accuracies +/- 0.5%. Zalkin 8 head rotary torque open chuck capper set on 7" centers cap size range 15mm to 40mm with 24" ID cap hopper / feeder. Control panel has filler, conveyor and pump, jog, run, reverse, cap turret and sorter on / off switches with start, stop, e-stop push buttons, no container / no fill / no cap. Mounted on stainless steel base frame with drip rim. Cozzoli Model FSVSC, stainless steel, monobloc filler, screw capper rated from 10 to 55 containers per minute – depending on materials and application. Container range: 12.7mm to 38.1mm in Diameter; 34.9mm to 111mm in Height. Equipped with 24" OD container unscrambler, Oyster Bay metering pump with a dispense range of 1 second per dispense and up to 30 ml per second with accuracies from 0.1% to 1% of continuous flow depending on product and size fill. (2) head diving nozzle filler currently set with 1/16" OD fill nozzles, 24" long container transfer conveyor with no container no fill / no cap sensors, 15" OD vibratory bowl and feed chute to orientate caps, to single head screw capper and can handle screw neck tubes as well as vials with proper change parts. Control panels with pump forward / reverse, on /off / start controls and feed speed dial, filler with start / stop, vibratory controls, speed dial. Mounted on stainless steel base frame with casters. 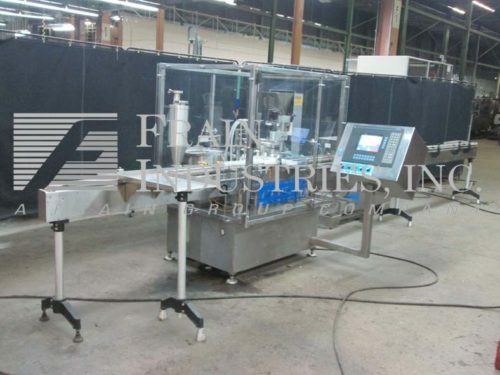 Filamatic Model MNB/P-LD, 1-up, automatic, stainless steel, monoblock filler, tipper and capper rated from 10 to 50 containers per minute – depending on materials and application. Container size range: 1/2" to 2-14" in Diameter; 1" to 5" in Height. Fill range: 0.5ml to 500ml with proper change parts and accuracies of +/- .5%. Equipped with 138" long x 3-1/4" wide plastic delrin container conveyor, with container feed station, 1-up piston filler, tip and cap feed have dual vibratory stainless steel, hoppers with level detection and single head screw capper, star wheel in feed and discharge, bottom up fill and missing bottle, tip, cap detection. Touch pad controller with panel view, tip, cap bowl and fill controls with start, stop and e-stop with operator interface data information control system. Last doing 5ml eye dropper style bottle. Fogg, Model FAA-3618, automatic, stainless steel, 36 head rotary, pressure gravity filler and 18 head rotary capper. Rated from 50 – 325 containers per minute – depending on materials and application. Equipped with a 3¼" wide container conveyor, worm screw to star wheel in feed and discharge, 48" turrett with (36) ¾" OD fill to level nozzles, set on 3¾" centers with 5" long x 3" wide container platforms, 48" OD product holding tank and 18 head rotary capper with (18) ____ style cap heads set on 4½" centers. Control panel with push button start / stop for filler and conveyor; push button jog, variable speed filler speed dial, on / off switches for cap sensor and bottle back up sensor, up / down switches for bowl and capper. Mounted on stainless steel base frame. Filler Specialties, Model AWFS-3612R, automatic, 36 head stainless steel rotary gravity filler and 12 head rotary capper. Rated 50 to 325 container per minute – depending on materials, application and machine configuration. Capable of filling containers up to ½ gallon. Equipped with 120" long x 4" wide conveyor with 24" long worm screw to star wheel in feed and discharge, (36) ¾" OD fill to level nozzles, set on 5½" centers with 4½" long x 4" wide container platforms, 36" long x 30" wide x 12" deep cap hopper with a 12" wide x 16" long live bottom conveyor, 52" long x 11" wide waterfall style cap sorter with 1" high cleats on 1½" centers and 12 head rotary capper. Control panel with push button controls for cap feeder, filler and bulk hopper. Variable speed controls for cap feeder and filler. Mounted on stainless steel base frame.